Solid Copper Outdoor Lantern "Barn Lamp"
The Barn Lamp is a solid copper hand crafted outdoor or indoor lantern. 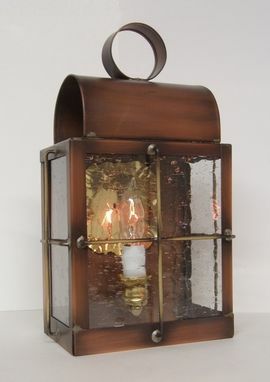 With one candelabra socket a beautiful light is given with a clear 40 watt bulb. Solid brass bars and cup. Perfect for many locations around your home. Inside a pair over the fireplace or side lights in the dinning and great room. Outdoor locations include entry ways side and back doors, porches and dark walkways. Double strength clear or clear antique glass. Hi-pot dielectric tested, premium Leviton electrical components insure a safe outdoor fixture. Dimensions: 11 1/2" tall x 6 1/4" wide x 4 1/2" projection.